The Ultimate Race Car Party delivers thrilling, action-packed entertainment for boys and girls in Los Angeles, San Fernando Valley, Orange County and San Diego. Hot Wheels hurtle down the All American Drag Strip, competing head to head, while miniature stock cars loop-the-loops on the Roller Coaster Track . 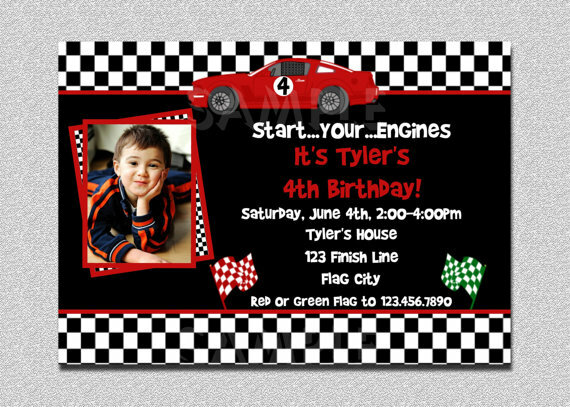 Rev up the excitement with race car-themed invitations. Use automotive or racing words and phrases as teasers– for example, “put the pedal to the metal”, “start your engines" or "get into gear". Don’t be afraid to be ridiculous. Goofy puns are part of the fun. "Call … to reserve your seat in the grandstand" or "Get your ticket to the races by e-mailing …"
If you prefer to manage your invitations and RSVPs on-line, take a look at Evite’s race car invitations, including Racing, Checkered Flag and our favorite, Animated Race Track. Want to include a photo of the birthday kiddo? 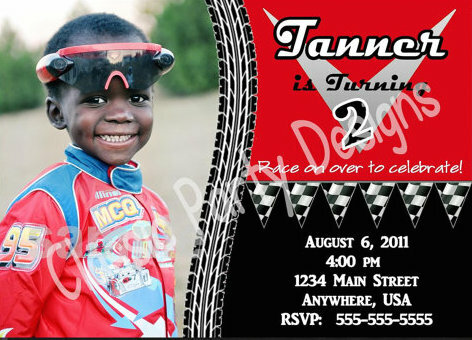 Etsy has a wide selection of printable race car invitations. Here are a few suggestions. 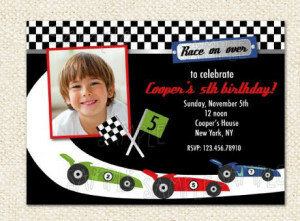 This invitation by Classic Party Designs has a high-octane race car vibe. Lollipop Prints playfully welcomes guests to “race on over” to the celebration. We like the way Trendy Butterfly asks for a “red or green flag” response. “Tickets” are clever and fun. 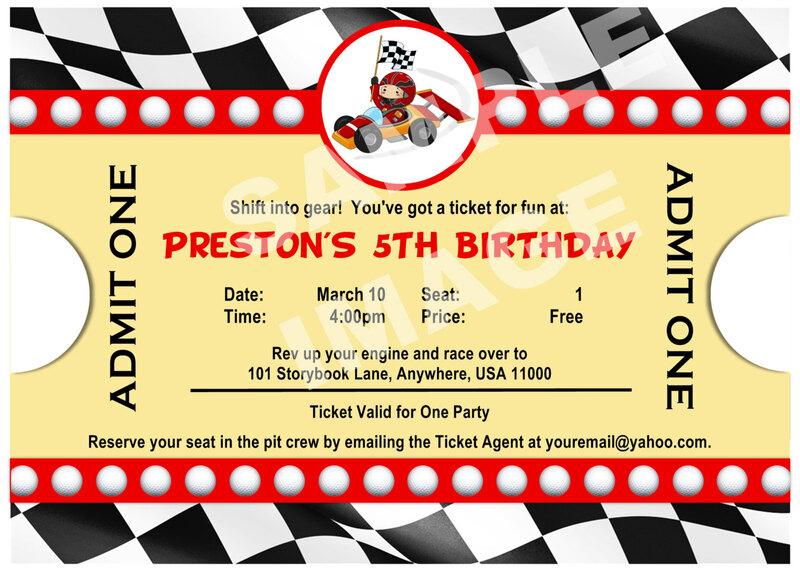 This charming invitation by Story Book Lane Crafts phrases the RSVP as "reserve your seat in the pit crew". 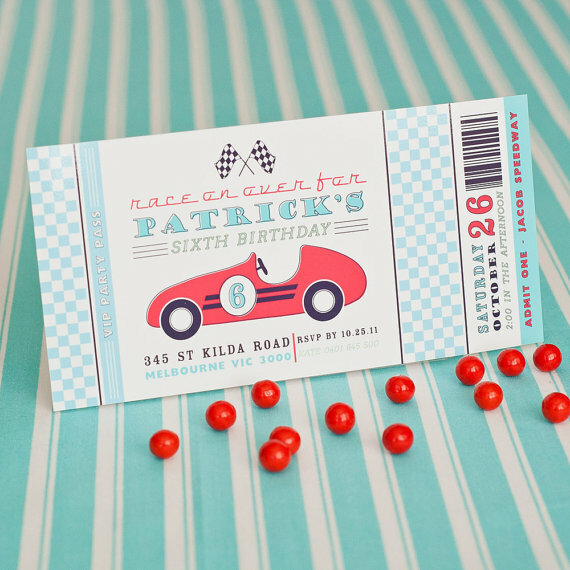 If vintage car racing is the theme of your party, then Anders Ruff’s turquoise and red ticket invitation might appeal to you. 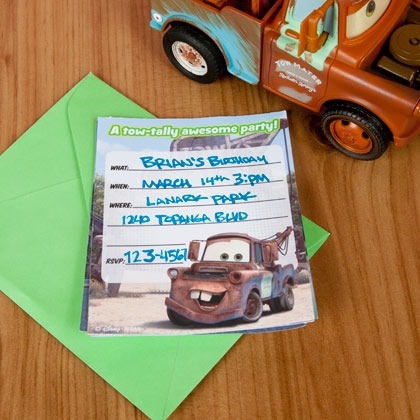 Partygoers will get their kicks on Route 66 when you send them Disney PIXAR “Cars” free printable invitations. They’re “tow-tally awesome” and feature Lightning McQueen, Mater and other Radiator Springs characters. 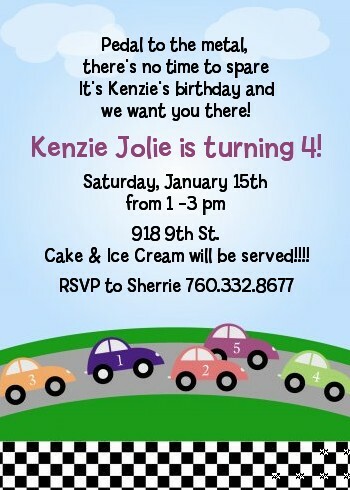 We’re sharing these last two invitations just because they’re so darn cute! This cheerful design by Candles and Favors makes us smile. And Amy Adele’s drawing has a sweet, hand-made quality. Come back soon for more race car party ideas. Book your Ultimate Race Car Party now in San Diego, Orange County, Los Angeles or San Fernando Valley with Playparty.net, Southern California’s premier provider of children’s birthday party entertainment.